I originally reviewed the Moby Aria shortly after it came out in May 2015. I have included that review below, and as you will see I really liked it. But a year and a bit later as a library carrier, the Moby Aria has not weathered well at all. While I still really like many features, and still often show it to parents, it is clearly not as well made or robust as the other carriers I have in the library. Within a few months I found that the plastic runners for the chest strap where starting to escape (somewhat like an errant under wire on a well worn bra) and then the chest straps themselves started coming off these runners. While it is possible to get these back on, its pretty tricky to do and normally something I have to ask David or someone else more dexterous than I to help me with! A couple of washes later and the carrier was already starting to fade in places. Then just last week while on what was only its 3rd or 4th hire, one of the seat dart seams ripped (pictured). While this isn’t a weight bearing seam and doesn’t affect the overall safety of the carrier it is a pretty unsightly. As you can see, its happened because a popper has been placed over this seam without adding any reinforcement to the seam at all. I sometimes make clothes for fun, and while I am distinctly a sewing novice… even I know this isn’t a great idea if you want something to last. Hence after only 15 months my Moby Aria is looking distinctly worse for wear,and is sadly no longer under warranty. Considering this carrier markets itself as being birth – 36 months it seems a shame that it doesn’t last anywhere near that long. In comparison I have seen 10 year old Manducas that have happily carried all of 1 family’s 3 children and are still going strong now in the hands of a new parent. 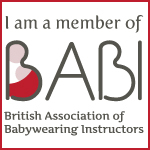 While I do think Manducas are exceptional in terms of their longevity and workmanship, my experience is the vast majority of buckle carriers will last well for at least 2 children – which I very much doubt the Moby Aria would be able to do. PS – as predicted below, and as anyone who has been to a library meet recently knows, I have indeed lost a number of those detachable bits and bobs off this carrier! Before the Aria arrived, looking over the specs, I turned to my husband David and said “we are either going to really love this carrier or we’ll be disappointed”. My reasoning was simply that it shares many of the features that we love about our much used and much loved Manduca, so either it would compare favourably or it would fall short. Fortunately, it was love! As well as the common ground with the Manduca, the Aria also has a few unique features that left us having conversations like “wow I think I like this even more…” and “if this had been on the market when we bought our carrier would we have bought this instead?”. Both David and myself found it really comfortable, both in front and back carries. I can see this carrier fitting a wide range of body shapes and sizes as it has three points for adjusting the straps, and so I would expect this carrier to be a good choice for partners who are very different sizes. Although this did mean the first time I put it on I did spend a couple of minutes adjusting but once I had found my settings it was really comfortable and I felt I got a really good fit by being able to tweak the fit in several different places. The strap design also allows you to cross the straps at the back while carrying your child on your front which I find essential for spreading the weight evenly across my back and managing to last through a long walk! For a hot day, the main panel of the Aria is attached by buttons and can be taken off to reveal just mesh. Providing plenty of support for your baby whilst keeping them cool by allowing air to circulate into the carrier. Which I can see being being really amazing in the middle of summer. The head support and sleeping cover are attached by velcro and also can come off. I love that the Aria comes with these things included (in the limited edition box from Slumber-Roo), and that they can be easily removed for cleaning or removed when they are no longer needed and thus reducing bulk but I do worry that if that if this was mine I would promptly lose all these bits and pieces. So I find myself torn because its great they have been included, and they are all useful for different phases, but will they get lost when they are not being used? Maybe most people aren’t as scattered brained as me! Fortunately the infant insert is attached and can’t be removed so no chance of losing it before baby number 2 comes along. Kudos to Moby for including the insert for free when many other brands sell inserts separately as extras. The insert is simply a section of material on the inside that via poppers forms a pouch that lifts a newborn higher up in the carrier keeping them close enough to kiss and so their face isn’t covered. This is in fact very similar to the Manduca infant insert. However, just the same as many infant inserts used by other brands, I do wonder if in practise this is slightly clunky to use as you have to sit down with your baby to popper them in and then again to take them out. Its not always that easy to sit down and put your legs up to do this! That said where I think the Moby Aria really comes into its own is for a baby around 3 months to 6 months. This is the ‘Black Zone’ of almost all SSCs. Nearly all SSCs have an infant insert that works (for better or worse) from newborn to about 3 months (depending on length and weight of the baby, which of course varies a huge amount) but then the baby doesn’t fit into the main seat of the carrier until they are 5 or 6 months (again size and carrier depending) and this can be really frustrating for parents. The Moby Aria has come up with an ingenious system for narrowing the main seat of the carrier using poppers to synch it in. There are 3 settings; narrow, mid and regular. The narrow is only a little wider than the infant insert so I can really believe that most parents wouldn’t have to experience the ‘black zone’ in this carrier. I am really happy to finally have an SSC I can show to parents of 3 month olds coming to the library desperate for an SSC. I’ve had a similar issues with the Aria stitching – really disappointing, only 15 months and the company who sold it and moby distributor aren’t intereted at all. Am wondering if it is a fault, either way these definitely aren’t built to last. I am sorry to hear you’ve had the same experience Louise. I was hoping that I was just unlucky but since the rip appearing on mine I’ve heard of a number of other issues … not all in the same place but other places too which makes me think in reality its just not very well made! Its sad for me as I have people coming to the library for whom the Aria would fit really well with its seat adjustment system but I no longer show it because I really don’t want to recommend something that I am not sure will go the distance. I also feel bad for those I did show this carrier before I had this issue and did buy one, because I never would have if I had any such doubts… i can only hope theirs last better than mine!